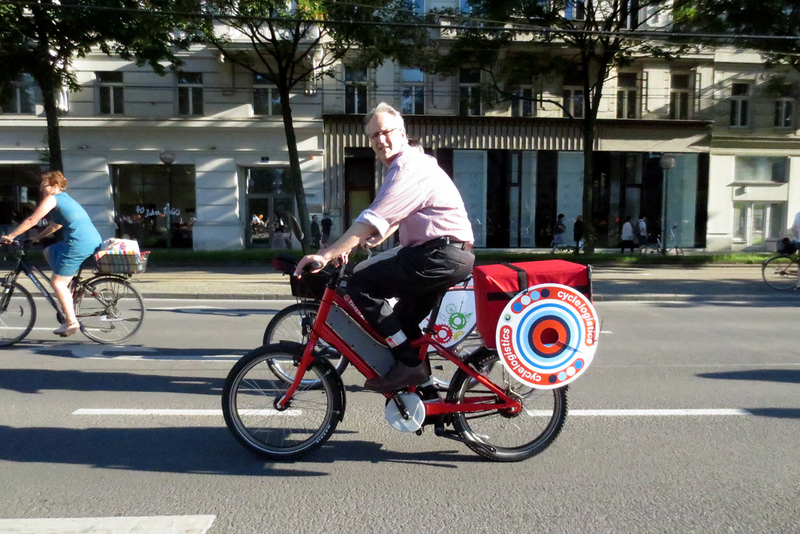 When listening to presentations at this year's Velo City Conference in Vienna, Austria about various city's newly unveiled bicycle strategies, it was easy to see which will be most user-friendly and adaptive to change. Among other criteria of course, the new cycle tracks (or cycle lanes, since some presenters' cities were not onboard with the Copenhagen style...) must boast widths to accommodate cargo bikes. To promote the cargo bikes' viability as present-day and future transport options for delivery and freight services, we are proud to serve as local partner in the EU project called CycleLogistics. We hope to work with a smorgasbord of nine other cities to replace smelly, antiquated delivery vans with gleaming new cargo bikes. The project is truly a game-changer, pushing the boundaries of bicycles for transportation. Here's a snapshot of the innovators who represented CycleLogistics' diverse ideas, innovation, and forward thinking via a Velo City 2013 lecture entitled, "Back to the Future: Cycle Logistics and Advanced Sustainability". Their bike enterprises and projects are hitting the ground running. 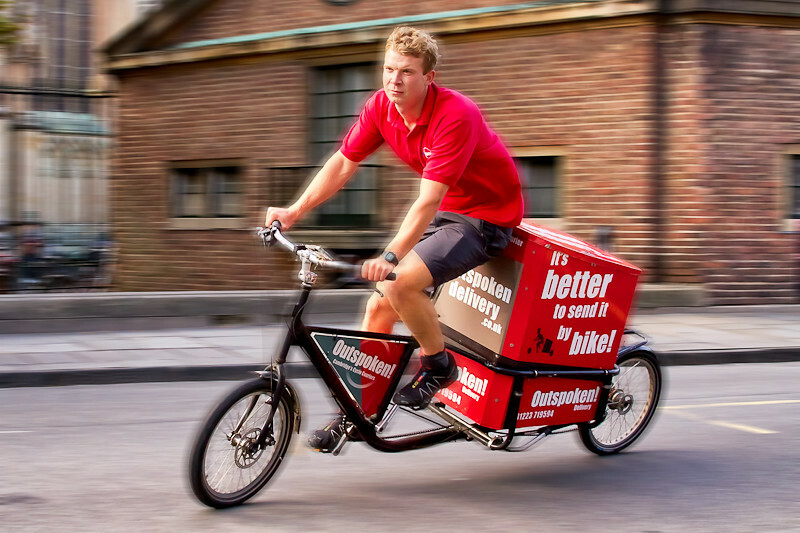 A return to the Dutch or Danish heyday of cycle-led logistics can and will return like a tide. Outspoken Delivery-- Rob King represents Outspoken Delivery from Cambridge, UK. Why rely on heavy, polluting trucks when this delivery service can pick up goods from city outskirts and deliver them within the city? The service is called "last-mile delivery"-- goods are consolidated, instead of relying on vans that on average are only half full. The goal is to create transit hubs outside the city, where trucks would load cargo onto delivery bicycles instead of vans. But just how much could a bike carry, you ask?...A hefty 250kg with one model and 60kg with another. Check out the presentation slides and don't miss the snazzy video embedded in the Prezi, while you're at it. Susanne Wrighton of FGM-Amor & Franz Hoelzl of Spar Salzburg, Austria discussed a local initiative from major food retailer, SPAR. Their Bike & Buy campaigns encourage shoppers to do just what the name entails. In total, the 15 Shop by Bike campaigns orchestrated by CycleLogistics will reach up to 3000 people in pilot projects of 1-2 months. Susanne Wrighton and mobility research/ communication company, FGM-Amor in Graz, Austria enlisted 400 participants to shop only by bike. 9 out of 10 said they would continue using their bicycles to return home from shopping after the program's end. Even better, 7 out of 10 said they would cycle for other uses and to other places. Biking is, as we know, infectious. Retail companies are also jumping on the cargo bike band wagon, as Ton Daggers describes, owner of International Bicycle Consultancy from the Netherlands. His work begins by asking whether bicycles can take the place of conventional traffic vans within cities. His answer, of course, is yes. His company has promoted bicycles for the last 20 years. The bikes he showcases in his presentation are used within the fleet of "big box" retailers and other commercial entities. Some of the bicycles are two-person outfits that enable the transport of even larger quantities of goods. Wouldn't it be cozy to buy a bed from Ikea with your partner and rest assured (no pun intended) that you wouldn't need to get a hold of a car to transport it to your new home? Originally working from the angle of positive health and movement promotion, Dr. Randy Rzewnicki now works on several projects with the European Cyclists' Federation, based in Belgium. With pure joy and enormous enthusiasm he documented the diverse array of cargo bikes he's seen during his first couple days at Velo City--at the bicycle fashion show, in city streets, and represented in media. 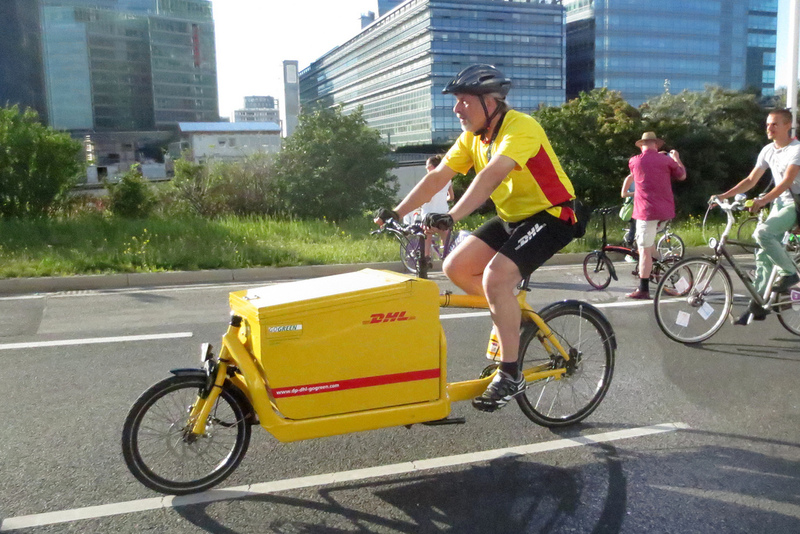 He described how DHL now uses cargo bikes to deliver mail and packages. When they buy these bikes, they make a corporate promise to use the bicycle to actually replace one of their vans. 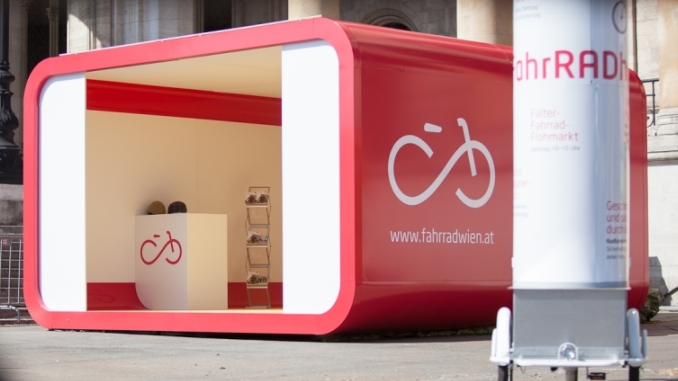 Additionally, the FahrRADhaus or "Bicycle House" (play on the word: rathaus or City Hall) was transported to the festival site entirely by bicycle, making it the largest structure moved by cargo bicycle. Their work shows what I wrote earlier: that a city's bicycle plan is only as good as their provisions to accommodate the growth of cargo bike-based business endeavors. The bikes are as eye-catching as they are useful and their business models will stand the test of time and the test of a world switching to non-carbon sources. They will do so with simplicity and ease of use. CycleLogistics works across borders for cargo bike promotion. For more information, you can like them on Facebook, follow them on Twitter, watch their videos on Vimeo, or read more on their official website. You can also learn more about our partner cities and the passionate people who make it all possible.